The Tiffany network is sticking with the Reagan family. CBS has renewed its Blood Bloods TV show for a ninth season. Although the police procedural has fallen in the ratings and has never been a strong performer in the coveted 18-49 year old viewer demo, it always draws a large total audience, even on Friday nights, when viewership tends to dip. 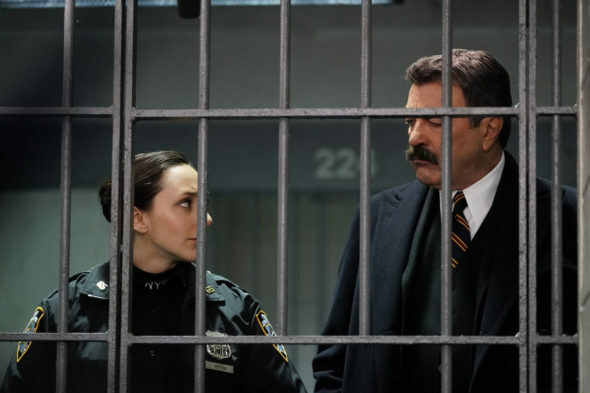 A CBS family drama, Blue Bloods stars Tom Selleck, Donnie Wahlberg, Bridget Moynahan, Will Estes, Len Cariou, Marisa Ramirez, Sami Gayle, and Vanessa Ray. The police procedural centers on the Irish-American Reagans, a multi-generational family of cops dedicated to New York City law enforcement. New York Police Commissioner Frank Reagan (Selleck) leads both the police force and his brood. The eighth season of Blue Bloods is averaging a 0.92 rating in the 18-49 demographic and 9.21 million viewers. Compared to season seven, that’s down by 26% and down by 12%, respectively. Thanks to its poor performance in the demo, Blue Bloods ranks 18th out of the 25 scripted CBS TV shows we’re tracking. However, when we sort by average total viewership, it rises to fifth place. What do you think? Do you still enjoy the Blue Bloods TV series? Did you think CBS would cancel or renew it for season nine? Let us know, below. We enjoy all the shows listed on CBS line up that we have them recorded in case we are not where we can watch. Please leave all the NCIS shows on, Blue Bloods, Hawaii 5-0, etc. Please leave Blue Blood on the air, that is the best show ever. On of the best shows love blue bloods. Love Blue Bloods. My husband and I never miss the Friday airing. Love the family dinners think it encourages people to have own family dinners. Probably my favorite tv show airing! I’ve enjoyed the show, but disappointed that none of the stars are connected with anyone, physically — one grandfather, one father, 2 sons, 1 daughter, 1 granddaughter and 2 grandsons. Really? Maybe the Eddie-Jamie engagement will solve that….hope so! I love the show Blue Bloods. I don’t even remember how long I’ve been watching it. It’s been at least 8 years. I never miss the Thursday all day shows, try to catch the Friday night show and look for it sometimes during the day if I’m home. I’m interested in the whole family being in law enforcement and I especially like the family dinners. I’m very happy that they were renewed.